Georgia Secretary of State and GOP gubernatorial candidate Brian Kemp is being sued for putting the voter registration status of tens of thousands of predominately African-American voters “on hold” for name discrepancies. He is in a close race for governor against Stacey Abrams, who would be the United States’ first black, female governor if elected. Critics have accused Kemp of using his office to conduct racially motivated voter suppression, but he says the holds are necessary to ensure the integrity of Georgia elections. Brian Kemp, Georgia’s Secretary of State and the GOP candidate for Governor, is being sued in federal court by civil rights groups over the voter registration status of thousands of African-American Georgia voters “on hold” just a month before his election against Democrat Stacey Abrams, who if elected would be America’s first black, female governor. Georgia is one of several states that uses an “exact match” voter verification system to confirm the identity of voters, requiring the name and spelling someone uses to register to vote to match the information on their driver’s licence and/or Social Security card. An error as minor as a one-letter spelling discrepancy or dropped hyphen from a last name could mean a voter’s registration application or status would be indefinitely stalled until they resolve the discrepancy with the relevant state or federal agency. Voters whose registrations have been put hold can still vote, however, if they bring an ID to the polls that “substantially matches” the name they used to register to vote, according to the ACLU of Georgia. 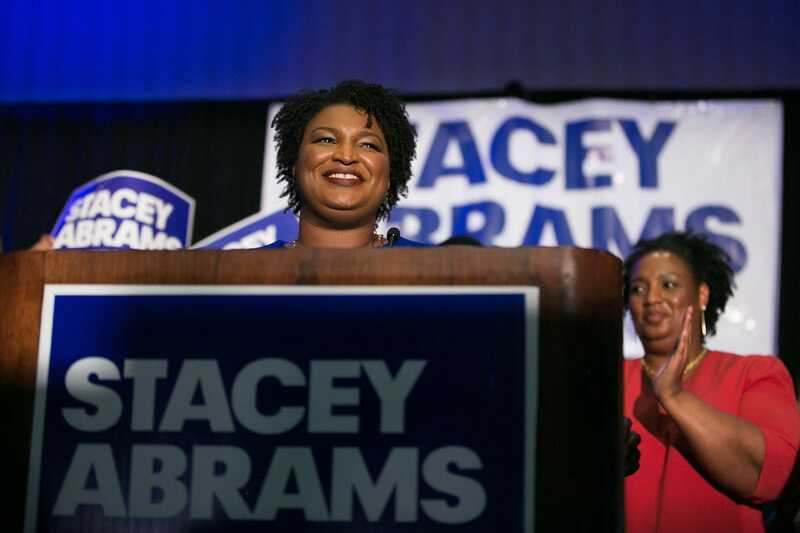 Jessica McGowan/Getty ImagesStacey Abrams won Georgia’s Democratic gubernatorial primary in May. Kemp, the top elections official in Georgia, has also come under fire for cancelling 1.4 million Georgia voter registrations since he took office in 2012. “We’ve shown that this process disproportionately prevents minority applicants from getting on the voter registration rolls,” Julie Houk, special counsel for the Lawyers’ Committee for Civil Rights Under Law, said of exact matching registration in an interview with the Associated Press. Kemp says the cancelled and stalled registrations are not intentionally suppressive, but necessary to ensure that noncitizens don’t vote in Georgia elections. Research shows voter impersonation is practically nonexistent across recent American electoral history. Kemp has also blamed Abrams herself, and the voter turnout nonprofit she founded, for the racial disparities in those affected by the registration freezes, accusing Abrams’ New Georgia Project of submitting voter registration forms with missing information or illegible names of voters. “As he has done for years, Brian Kemp is maliciously wielding the power of his office to suppress the vote for political gain and silence the voices of thousands of eligible voters – the majority of them people of colour,” Abrams spokeswoman Abigail Collazo told CNN.